A student nurse working at the Royal Preston Hospital has been forced leave a note on her windscreen begging local residents not to vandalise her car after she returned from a shift to find that one of her tyres had been let down. The 22-year-old - who does not want to be identified - was parked legally on an estate directly opposite the hospital late last week when the incident happened. Heversham Avenue, where student nurses have reported damage to their cars. In her message, she explains that she “works 37.5 hours a week for free" as part of her placement and cannot afford to pay for parking - even if she were eligible for a permit. Another student claims to have had a cone deliberately placed under her car, leaving her with a repair bill which will cost her “a fortune”. “Thank you to the lovely person who shoved a cone under my car while I was working a shift at Preston Hospital. The underneath of my car is completely ripped,” she wrote on Facebook. Gatesgarth Avenue, where there are no limits on parking along one side of the road. 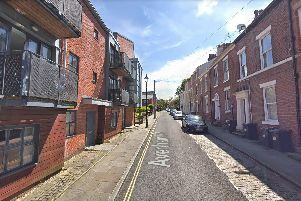 The Lancashire Post has since spoken to full-time NHS staff who also claim to have been subject to verbal abuse or criminal damage for parking in residential roads in the vicinity of the hospital. Andrew Bamber, a radiographer at the Royal Preston, said that he experienced similar issues when he was a student. Although he now himself lives in a street close to the Sharoe Green Lane site himself, he says his sympathies still lie with the staff struggling to find somewhere to park. “I have had notes put on my car telling me I shouldn't be parking there and had my car keyed. Once, somebody even covered my windscreen in mud,” Andrew recalls. “I am very sorry to hear that this sort of childish behaviour is still happening. If there are no parking restrictions and the car owner pays road tax, then there's no reason why NHS staff cannot park outside people's houses. Perhaps the police should remind people in this area of that fact, because damaging another person's possessions is a criminal act.,” he adds. Sam Liptrot, who works at the Royal Preston in a clerical role, also has first-hand experience of what it is like to live close to a busy hospital - his home is a short distance from Blackpool Victoria. “I've encountered problems with numerous residents in Preston - on an almost weekly basis,” Sam says. “I park on the residential roads around the Black Bull. Every morning there are swathes of cones put out on the road and pavements by residents, particularly on Greenway and Northway. Most of the time I just move the cones out of the way to allow me access to park. The atmosphere in the area even influenced the type of car which Sam bought when he changed his vehicle last year. “I bought a second-hand car back in September and purposely got one that is already dented and scratched to try and deter residents from causing any damage to my vehicle. “I have had a couple of residents confront me regarding parking in front of their houses, threatening damage if I was to park there again. “I just genuinely think it is pathetic that these people are so incensed by NHS staff parking there when, as we already know, they [objected] to Lancashire Teaching Hospital planning permission for a multi-story car park to be built on the hospital grounds. “A lot of people at Royal Preston Hospital that have to park off-site are the people who are in the lower pay bands like myself. I cannot afford to pay for parking every day even if I wanted to," Sam added. Lancashire County Council has confirmed that it has placed cones on some streets in the area as part of work to extend parking restrictions or repaint existing lines. One resident on the road said he felt sorry for anybody who had to visit the hospital by car, but added that not everybody parked with consideration. “I’ve been here 30 years and I’m well used it to by now - you can’t do anything about it,” said the man, who did not want to be named. “I have sympathy for the nurses and relatives of patients coming to the hospital. People don’t want to be worrying about parking when they are visiting someone who is sick. “I don’t know the answer you can’t get on the car parks sometimes and they charge too much, in my opinion. “But you always got the odd driver who is ignorant - they park straight across your driveway and just walk off. You have to let it go over your head,” he added. Lancashire Constabulary has been contacted for comment about the issue. The trust which runs the Royal Preston has said that it is revisiting the option of building a multi-storey car park on the site. Lancashire Teaching Hospitals (LTH) already has planning permission for the facility, but had previously said that it was awaiting the outcome of a forthcoming consultation into a reorganisation of NHS services in Central Lancashire, before beginning work. Karen Partington, LTH chief executive, condemned reports that staff were being targeted. “We realise that the parking arrangements at our hospitals are far from ideal and affect our staff as well as cause frustration for local residents, but these sorts of incidents are completely unacceptable. “Our staff come to work to provide the best possible care for our patients and should not have to deal with damage to their cars or verbal abuse for parking in a nearby street when they return at the end of their shift. “We would encourage any of our staff who do encounter this type of behaviour to report such incidents to the police,” she added. As of April, on-site permits will cost £156 per year for full-time members of staff who earn between £20,000 and £40,000. Off-site permits attract a 50 percent reduction and allow staff to park at Preston Business Centre, Preston Grasshoppers or Preston’s College. They can then park onsite at Royal Preston from 4pm Monday-Friday untii 8am, the next day and all day Saturday and Sunday as well as public holidays. An out-of-hours permit allows parking at the sites listed above and on-site between 12 noon and 8am the next day. Lancashire Teaching Hospitals say any staff member with an out-of-hours permit who leaves the site after 8am due to shift handovers or delays in leaving wards as a result of patient care will not receive a penalty charge notice. Last year, the trust announced plans to overhaul how staff permits are allocated. Historically, they have been handed out based on length of service, rather than shift patterns. UNIVERSITY INVITES TO STUDENTS TO "EXPLORE ALL TRAVEL OPTIONS"